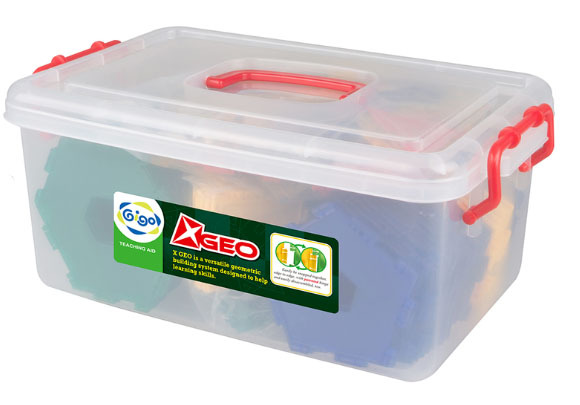 Including 7 different shapes of X GEO in opaque or transparent and a Solid-Opening Tool. Each set is packed in a plastic box with lock and a colouful wrap. ●X GEO is a geometric building system with 7 basic geo shapes easily disassembled with patented hinge. ●X GEO is available in opaque and transparent. ●Each shape has the same shaped hole in the centre for easier shape-recognition, handling and shape-tracing. ●Build Prism, Pyramid, Platonic Solids and Archimedean Solid models [except the one marked A] at the same time for easier observation, comparison and discussion in class.